Felony disfranchisement is the practice of denying people with felony convictions the right to vote. 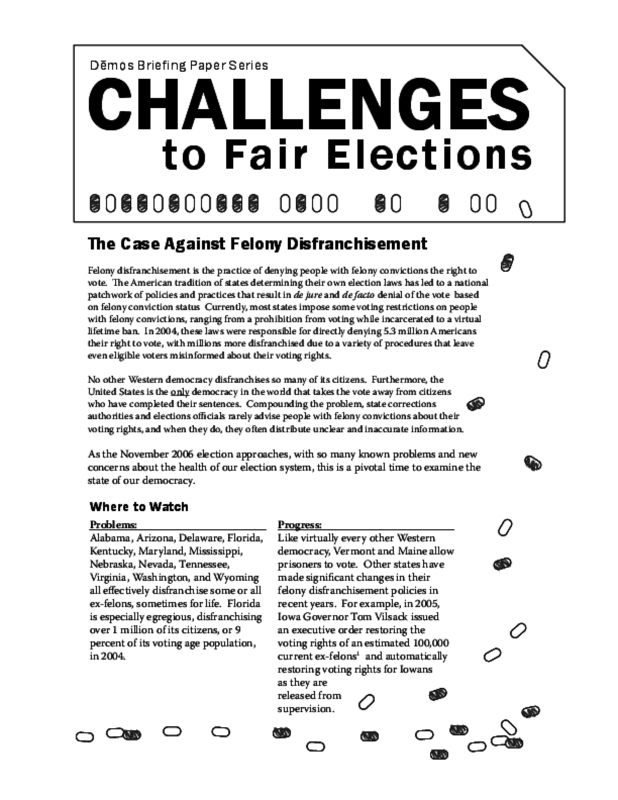 The American tradition of states determining their own election laws has led to a national patchwork of policies and practices that result in de jure and de facto denial of the vote based on felony conviction status Currently, most states impose some voting restrictions on people with felony convictions, ranging from a prohibition from voting while incarcerated to a virtual lifetime ban. In 2004, these laws were responsible for directly denying 5.3 million Americans their right to vote, with millions more disfranchised due to a variety of procedures that leave even eligible voters misinformed about their voting rights. No other Western democracy disfranchises so many of its citizens. Furthermore, the United States is the only democracy in the world that takes the vote away from citizens who have completed their sentences. Compounding the problem, state corrections authorities and elections officials rarely advise people with felony convictions about their voting rights, and when they do, they often distribute unclear and inaccurate information. As the November 2006 election approaches, with so many known problems and new concerns about the health of our election system, this is a pivotal time to examine the state of our democracy.